I am embarrassed to admit how many shamrock shakes I consume during this time of year. I can’t help it, I love the things and nothing hits the spot after a busy day like a trip through the drive thru and being handed a frosty cup of green goodness. Here’s the problem, they are not ALWAYS available. That is why I have learned how to create my own at home. They are really simple to make and you can adjust the ingredients for those who do not like too much of the minty flavor in their shake. Combine the first four ingredients in your blender until smooth and incorporated. Pour into 2 glasses, top with whipped cream and sprinkles and enjoy! 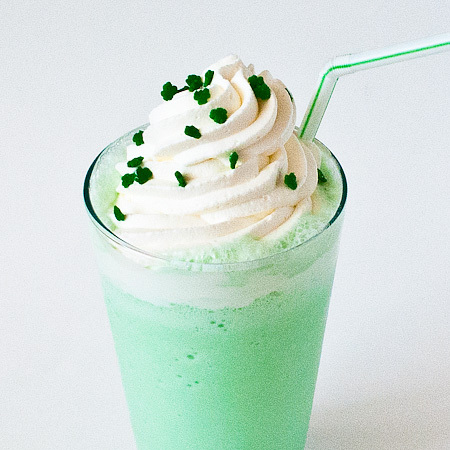 Aside | This entry was posted in Food, Uncategorized and tagged homemade, recipe, Shamrock shakes. Bookmark the permalink.